Here is our selection of awesome Tie Dye Tees and Printed T-shirts plus a selection of waistcoats, from the respectably reserved to the outright bonkers. These stonewashed t-shirts are decorated with a beautifully intricate, golden flower of life design. 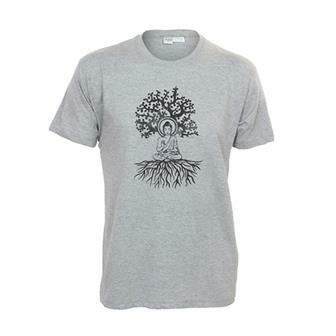 These simple grey t-shirts feature a bold drawing of Buddha sitting beneath the Bodhi tree, the site of his enlightenment. 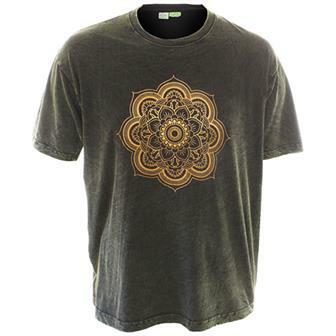 Awesome dark cotton T-shirt with a beautiful floral mandala design printed in gold transfer. Given a rustic stonewash and available in two dark colours. 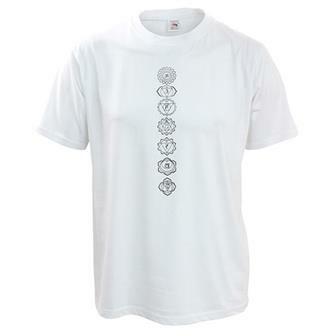 Soft cotton white t-shirt carefully screen printed in Nepal with detailed black chakra symbols. These tee's are great for relaxed summer chilling or a spot of yoga. 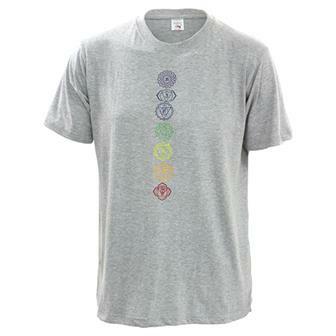 Soft cotton tee carefully screen printed in Nepal with rainbow coloured chakra symbols. This t-shirt is great for summer chilling or for wearing whilst pulling some yoga poses. 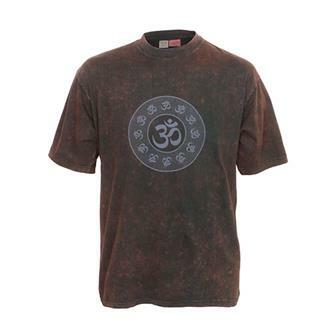 These dark, stonewashed t-shirts are printed with a circular symbol of the Om mantra. 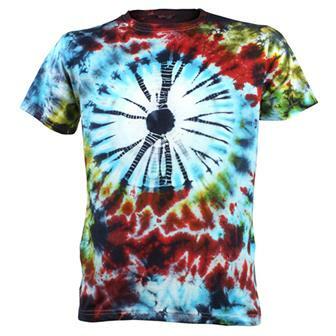 Amazingly bright, psychedelic tie dye tees, available in seven rad designs. Perfect festival wear for all dudes and dudettes. Sorted! 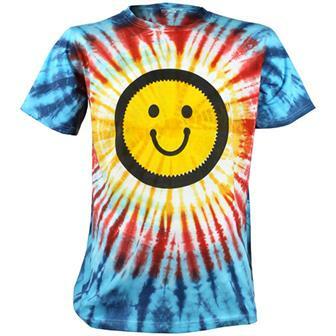 Revisit that second summer of love and get raving with this smiley face tie dye tee. Our tie dye tees are hand made in Nepal and because of this, the colours may vary slightly. 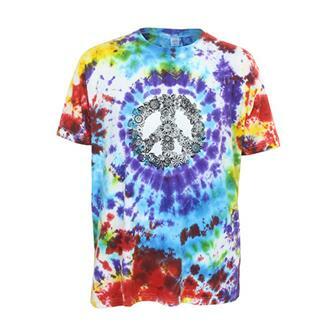 Featuring an intricately designed peace symbol made of flowers, these vividly coloured tees are necessary apparel for any righteous dude or dudette. Decidedly far-out threads for sale here! 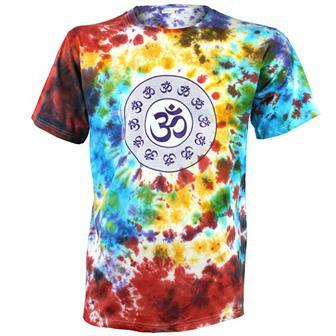 This t-shirt features a vividly bright tie dye design and a circular Om symbol print in the centre. Our tie dye t-shirts are hand made in Nepal and as a result of this the colours may vary slightly. 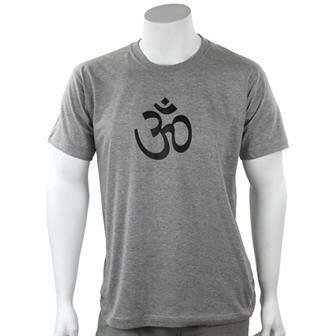 Featuring a black Om symbol, these simple but striking t-shirts are great to wear with pretty much anything. Try combining them with a pair of our funky trousers. 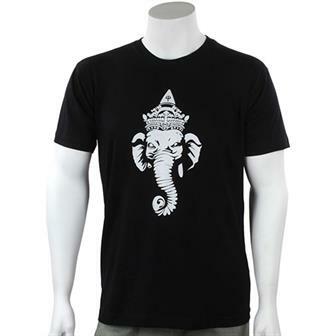 Featuring a depiction of Ganesh, the Hindu elephant god, these simple but striking t-shirts are great to wear with pretty much anything. Try combining them with a pair of our funky trousers. Featuring a colourful set of prayer flags, these simple but striking t-shirts are great to wear with pretty much anything. Try combining them with a pair of our funky trousers. 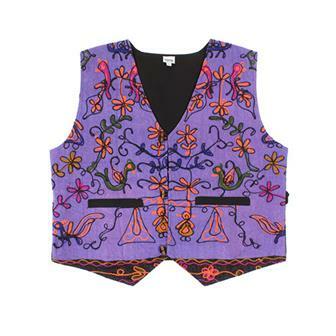 Named after the Hindi word for needlework, these intricately embroidered waistcoats are carefully handmade in India. From the Hindi for peacock, our delightful Mor waistcoats are handmade in India and each is carefully embroidered with delicate peacock and traditional needlework patterns. 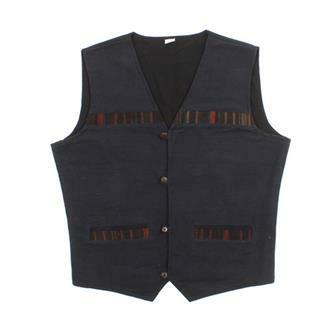 Named for and inspired by the first prime minister of India and his famous high collared jackets, these stylish waistcoats feature a brilliant level of traditional embroidery and four wooden toggles. 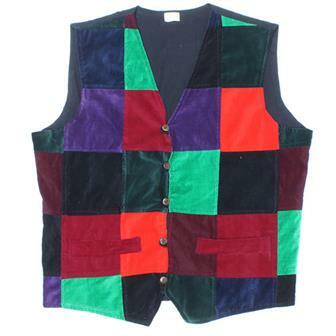 Classy and comfortable, this lined waistcoat is made from deep coloured and wonderfully tactile velvet patches. Please note, colours may vary slightly from those shown. 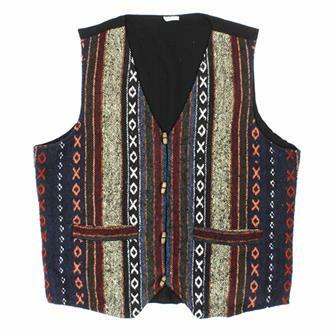 Elegant with an ethnic twist, these beautifully rustic cotton waistcoats have heavy cotton front panels embellished with lines of traditional Tibetan style trim, finished with polished coconut buttons and two generous front pockets. 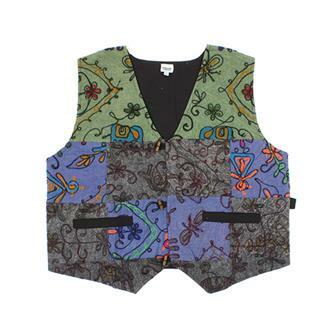 Made from soft brushed cotton material and plain black cotton lining, these fantastic waistcoats are a sure fire hit at colourful summer festivals. 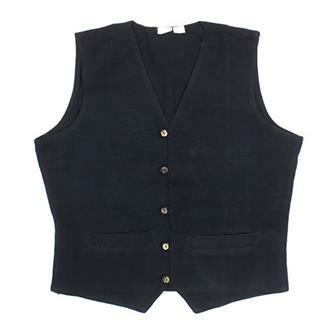 These classic plain black waistcoats are made from tough cotton with two pockets and four front buttons. 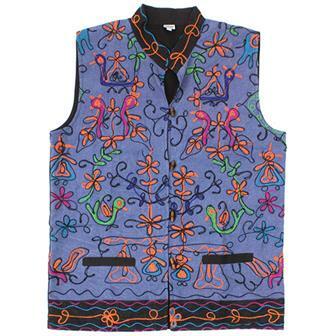 They have proved to be a hit at folk festivals and we have seen a great deal of waistcoat customisation; they are a blank canvas for all kinds of badges, patches and trinkets!